If you have ever watched the ants in an ant farm, you have probably noticed ants sitting around seemingly doing nothing. This leads to the question: are the ants sleeping? 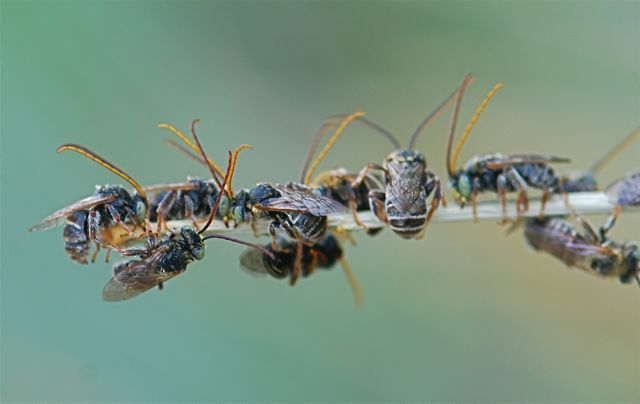 Whether or not social insects sleep is a question that has gotten some definitive work in the bees. In fact, there are bees that are affectionately called “sleeper bees” for their behavior of resting on plants in clusters over night. For example, these long-horned bees of the tribe Eucerini (named for the long antennae present on males), are often seen resting in clusters on plant stems. 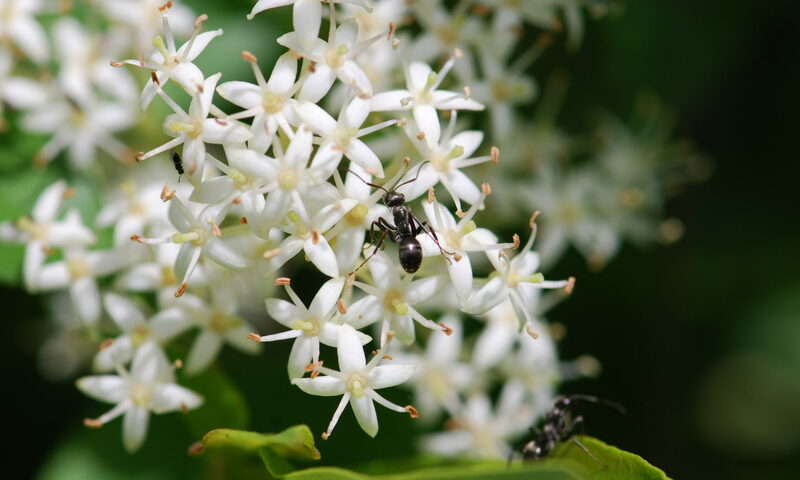 Other bees and even wasps have been known to “sleep” over night in flowers. Recently, Klein et al. conducted an experiment on sleep in honey bees. They showed that depriving worker honey bees of sleep during the night, using a magnetic device, actually effects their ability to perform waggle dances the next day. Discover Magazine has an article with a brief video of sleepy bees dancing, shown here (with a sponsor ad at the end). What about ants? Do ants sleep? Many myrmecologists have noticed that a certain portion of ants in laboratory colonies spend a lot of time doing nothing. Blaine Cole (1986) reported that workers of the ant Leptothorax allardycei spent up to 55% of their time resting, which he called quiescent. Nigel Franks’ group writes that Leptothorax acervorum workers in the nest are inactive for 72% of the time and and foragers 15% of the time (Franks et al. 1990) and that Temnothorax albipennis workers are inactive about the same percentage of time in small colonies (44%) as in large colonies (46%) (Dornhous et. al. 2009). None of these scientists have actually gone as far as to say these ants are sleeping though. Deby Cassill in 2009 broke with tradition and calls certain periods of rest in ants “sleep.” Working with fire ants, she videotaped ants in an artificial nest. She created an artificial colony with three queens, 30 workers and 30 larvae. Checking the posture and position of the antennae, she concluded that queens sleep 90 times per day for 6 minutes per nap, whereas workers dosed 250 times per day for roughly one minute at a time. You can see a video of the set-up at the BBC Earth News. Cassill even went as far as to label Rapid Antennal Movements (RAM) as the invertebrate equivalent to Rapid Eye Movement (REM) sleep in vertebrates. Her conclusion: yes, ants sleep. Are we ready to agree? 1. 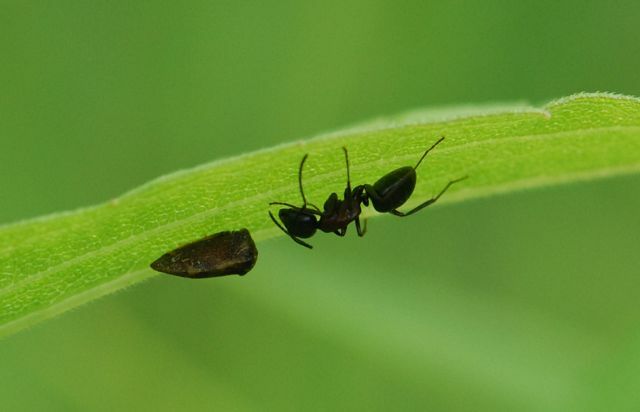 What do you think about the studies that observe ants spend a lot of time doing nothing? My thoughts: One thing that is immediately apparent in contrasting the honey bee studies with the ant experiments is that an artificial honey bee hive is much more “natural” than a laboratory ant nest. In a demonstration hive the bees usually have access to outside foraging, they have comb, they are going about their business as usual.The ants, on the other hand, have no soil to move, no myrmecophiles to interact with, no predators, no opportunity to move brood to optimal locations, etc. etc. It seems evident that greatly reducing the number of available tasks at hand limits the conclusions that can be made about the behaviors observed. 2. Can ants, or even insects, sleep? My thoughts: Seems like a reasonable idea, especially looking at the honey bee study. 3. What do you think of the “power nap” finding with fire ants? My thoughts: Having spent some time filming ants, I know that they are sensitive to vibrations we humans do not even notice, such as the laboratory incubators coming on and off in the room next door. I don’t have a copy of the paper yet. Does anyone know whether Cassill placed her artificial nests in such a way to minimize artificial disturbances, for example, placed them on vibration dampening pads? If not, it seems possible that something was disturbing those ants to keep them awake more often than usual. Barrett A. Klein, Arno Klein, Margaret K. Wray, Ulrich G. Mueller, and Thomas D. Seeley. 2010. Sleep deprivation impairs precision of waggle dance signaling in honey bees. Proceedings of the National Academy of Sciences (PNAS). 107 (52): 22705-22709. Deby L. Cassill, Skye Brown, Devon Swick and George Yanev. (2009), Polyphasic wake/sleep episodes in the fire ant, Solenopsis invicta. Journal of Insect Behavior. 22 (4): 313-323. Formicidae): time budgets and the evolution of worker reproduction. Behav Ecol Sociobiol. 18:165–173. Nigel R. Franks, Steve Bryant, Richard Griffiths and Lia Hemerik. (1990). Synchronization of the behaviour within nests of the ant Leptothorax acervorum (fabricius)—I. Discovering the phenomenon and its relation to the level of starvation. Bulletin of Mathematical Biology. 52( 5): 597-612. Very good point about the laboratory conditions, Roberta! I took a quick look at the paper, and there wasn’t any mention of cushioning. They were very careful about addressing light conditions, though. Sorry that we’ve fallen off the wagon in terms of The Fire Ants (the lab’s been too busy for lab meetings this semester). Definitely enjoying reading your posts, though!!! I appreciate you taking the time to check that point in the paper. One advantage of blogging the book is that you can jump into the conversation whenever you get a chance. The next three chapters cover the material I was least familiar with, the colony establishment via raiding. Definitely interesting reading. So if they sleep, do they dream? And if so, what about? Now, those are good questions. Wouldn’t it be cool to find out?